Girls night out. I absolutely love the opportunity to get out and enjoy some girl time! For a recent girls night out, my friend Melissa and I headed to the Lincoln Park neighborhood of Chicago for a fondue dinner at Geja's Café. 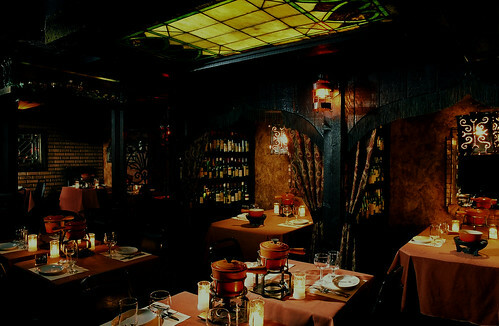 We had no idea how much fun it was and how this romantic restaurant is a perfect place for a girls night out. When we first arrived, we were warmly greeted by manager, Kirby Matthews. He invited us over to the bar where our bartender, Arturo, treated us to a few of their cocktails including a chocolate martini and a tropical drink, along with a few tastings of their wines. Kirby sat with us to share the history of Geja's and to provide some really insightful information about their wine program. The restaurant has an extensive wine list and every other month, they have a featured wine list based on a theme. This is such a fun and creative way to showcase wines and to help folks find something they enjoy. Another way they make wine tasting and pairing fun is through the monthly Winemaker's Dinner they host. Each course is paired with an appropriate wine along with a lively discussion lead by a representative of the featured winery. These are highly popular interactive dinner events where space is limited and reservations are only accepted by telephone only. If you miss the November Winemaker Dinner, no worries - the next one in December is featuring Laurent-Perrier! So after having our fill of wines and wine education, our table was ready. We started our dinner with the first course - Geja's house salad. It was a nice light starter where the greens were dressed with a tangy Dijon vinaigrette. Shortly after, our second course arrived and the cheese fondue was heavenly. 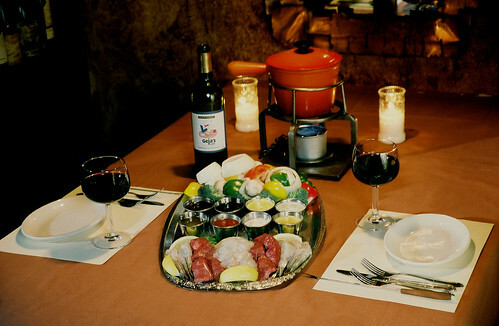 We had a pot of bubbly, creamy Swiss Gruyere cheese fondue set on our table, melted over an open flame. To enjoy with our cheese fondue, we also had a basket of assorted breads and fresh apples and grapes. By now, we were content and probably weren't ready for the feast in store. The third course came and we were presented with an amazing platter of fresh meats including aged beef tenderloin, delicate lobster tail, jumbo shrimp, plump Atlantic sea scallops and tender boneless chicken breast. They were all cut in bite sized pieces for us to easily cook in a table side pot of sizzling vegetable oil. Hot oil fondue was intimidating at first but Melissa and I soon got comfortable. Perhaps too comfortable lol because we were cooking things left and right. Granted, we may have lost a few things in the oil but we found them eventually and had fun fishing them out with our skewers! Oh, and did I mention the buffet of sauces we got to dip our succulent meats in after cooking? Sauces ranged from horseradish, apricot, garlic dill, teriyaki and a few more, eight in total. And of course, we balanced things out with a mountain of fresh vegetables including onion rings, broccoli, bell peppers, mushrooms, etc. Last and definitely not least, was the amazing dessert course. Geja's famous chocolate fondue is flamed table-side and presented with marshmallows for roasting, along with buttery pound cake, fresh strawberries, banana slices, pineapple and cherries. It certainly was a perfect ending to the meal and we both felt like a kid again simply for the opportunity to roast marshmallows over an open flame at the table! 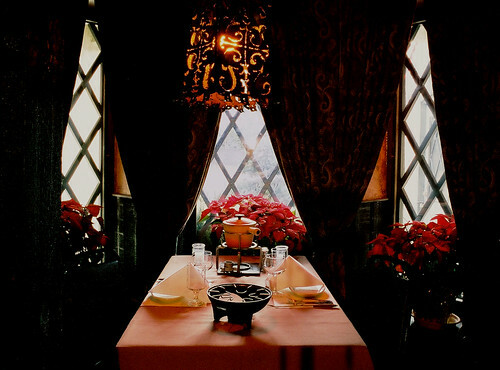 Now Geja's Café is known for being one of the most romantic restaurants in the city with their dim, soft lighting and flickering candles. There were certainly a fair share of love struck couples around us but at the same time, Geja's Café is also a great place for a night out with the girls or guys, which were also seen the night we dined there. If you think fondue was just a thing of the past or more of a retro dining experience, you really need to come out to Geja's Café to understand and experience fondue at its finest. 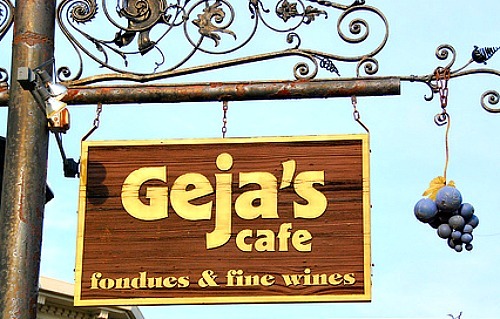 With an extensive menu that's fun and delicious, as well as educational and insightful events such as their monthly Winemaker dinners, definitely check out what Geja's Café has to offer! 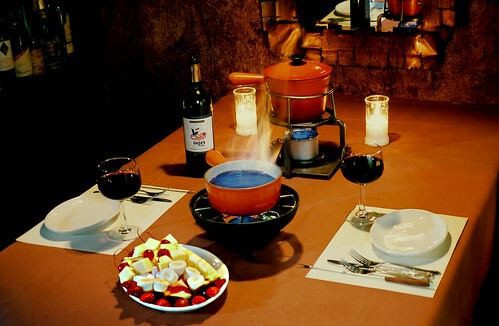 Melissa and I had a fantastic time with a wonderful experience of fondue thanks to the amazing staff at Geja's Café. 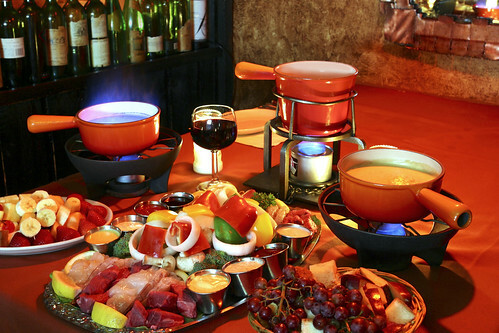 Fondue restaurants are fabulous for a girls' night out.